Your ABS-CBN primetime viewing will never be the same again as one of the finalists of The Voice Kids will be appearing in Hawak Kamay. One its trailer, while the kids were playing, Juan Karlos arrived and joined them. His entrance in the said teleserye is an addition to its supporting casts. This will surely be interesting since there are so many fans out there who are looking forward to seeing Juan Karlos act. We have seen Juan Karlos sang and impressed the judges in the recently concluded The Voice Kids. One of his strengths that made him increase in appeal was his charm. It was evident on his performances as his coach Bamboo developed him to have a kind of jazzy style in singing. 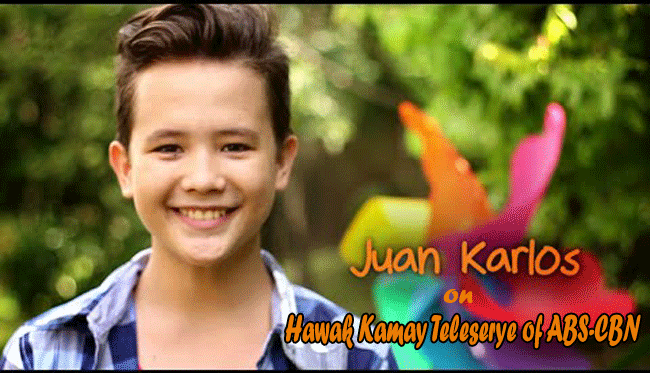 You will surely love to see Juan Karlos in Hawak Kamay. Hawak Kamay is a primetime teleserye of ABS-CBN featuring Piolo Pascual, Iza Calzado, Nikki Gil, Zailjan Jaranilla, Xyriel Manabat, Andrea Brillantes and Yesha Camile as the main casts. It has four directors namely Jerry Lopez Sineneng, Erick C. Salud, Mae Czarina Cruz-Alviar and Rechie del Carmen. To give you an idea of the plot, Piolo Pascual here became the guardian of the three orphans which were adopted by her late sister. Piolo in the person of Gino in the teleserye was a frustrated musician and on the teleserye, he will prove that it is not just being related that is important because love makes a family. What will be Juan Karlos’ role in Hawak Kamay? Well, this is for us to discover. Hawak Kamay airs after TV Patrol and it has started last July 21, 2014. Keep watching Hawak Kamay and be inspired by the lessons that the teleserye is teaching. If you are a fan of Juan Karlo, this is your moment to see him act on television.